Rio should still host the Summer Olympics—the risk of Zika is not high enough to warrant canceling them. Municipal workers wait before spraying insecticide at Sambadrome, where Carnival takes place, in Rio de Janeiro on Jan. 26. Eighty years ago this summer, courageous people from all over the world travelled to Berlin for the Nazi-hosted Olympics, none more famously than Jesse Owens. It is ironic that as this event is commemorated, the current Olympics in Brazil are in danger of being canceled due to fear. 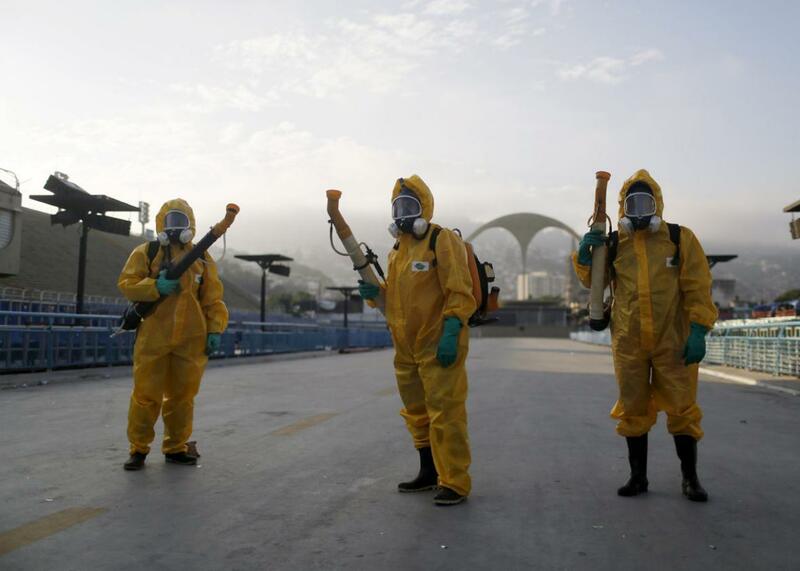 It is the fear of Zika, not the threat of the virus itself, that is causing some people to call for delaying, moving, or canceling the Rio games. One proponent of postponement, relocation, or both is University of Ottawa professor Amir Attaran, who suggests proceeding as planned could create “a full-blown global health disaster.”* Believe me, I am not trying to minimize this or any other health risk, but the fact is that Zika—or its cousin, dengue—has not risen to the level where the Olympics should be canceled any more than Major League Baseball should have relocated a series between the Pirates and the Marlins originally scheduled to be held in Puerto Rico. For that to happen Zika would have to be far more contagious or far more likely to take root in the home countries where people travel to the Olympics (or Puerto Rico) from. Remember, though fear of Zika spreads rapidly from human to human, almost all Zika transmission requires a mosquito—particularly, an infected female Aedes species mosquito. (While sexual transmission of Zika is possible, wearing condoms is an effective way to stop the spread of the disease—and even the Pope agreed it is the right move.) This results in a low risk of infection when compared with other diseases—measles, for example, infects 90 percent of the unvaccinated who come in contact with it. And though we have those mosquitoes (Aedes aegypti) in the United States, it is unlikely that we will see a Zika epidemic. Dengue fever, which is transmitted by the same mosquito, has never taken root here despite more than 200,000 cases a year in neighboring Mexico, for example. This is because we don’t have the same kind of mosquito control problem that Brazil has, even in our poorer areas where there is a lot of still water. Aedes mosquitoes typically lay eggs in and near standing water in things like buckets, bowls, animal dishes, flower pots, and vases. They are aggressive daytime biters, prefer to bite people, and live indoors and outdoors near people. Dr. Anthony Fauci, director of the National Institute of Allergy and Infectious Diseases at the National Institutes of Health, told me that the key to containing Zika is mosquito control (the World Health Organization has been advising the use of insect repellants in conjunction with avoiding impoverished and overcrowded areas). He said that Brazil has curtailed the problem before, only to see the disease-carrying mosquitos swarm back when public health measures—including larviciding, insecticide use, and ridding public places of still water—went lax. Don’t get me wrong, the number of Zika cases reported in Brazil has increased dramatically over the past few months, with more than 90,000 likely cases registered by the Brazilian Health Ministry from February to the beginning of April. And yes, 35,505 of these cases are in the Olympic city of Rio de Janeiro, and there have also been 4,908 cases of confirmed or suspected associated microcephaly. But for most people, Zika remains a very mild flulike infection with 80 percent of those infected having no symptoms at all. On the other hand, scientists are fanning the fear flames with grandiose statements. Attaran writes that “an estimated 500,000 foreign tourists flock into Rio for the Games, potentially becoming infected, and returning to their homes where both local Aedes mosquitoes and sexual transmission can establish new outbreaks.” In the light of such proclamations, the WHO’s feeble response (a joint statement with the Pan American Health Organization released Thursday) offered that “the games will take place during Brazil’s wintertime when the risk of being bitten is lower.” This is not likely to reassure panicked travelers. What should reassure them is that Zika is extremely similar to dengue fever in terms of how it is spread, and this disease has never taken hold here or in Europe, despite close to 400 million cases a year worldwide according to the Centers for Disease Control and Prevention and the WHO. The same is true of West Nile virus, another mosquito-borne virus that caused a major scare here a decade ago but never managed to cause a major outbreak. The mosquito is not just a vector for Zika, it is also a barrier to widespread outbreaks. It is reasonable to limit travel for pregnant women and to screen potentially pregnant women at the airports to Rio right before the Olympics, but canceling the games is not necessary for public health reasons. I would first want to see evidence that travelers from Brazil are fueling outbreaks in the U.S. and elsewhere before instituting harsher measures. We must be governed by our analysis of the data, not by our fear of unlikely outcomes. Read more of Slate’s coverage of the Zika virus.